The Deep and Frequent Phenotyping Study (DFP) is a multi-centre, observational study of prodromal Alzheimer’s disease (AD) and forms part of the Dementias Platform UK. 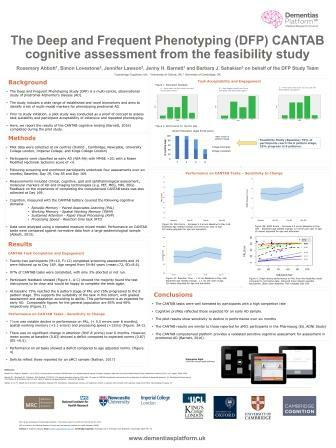 The study includes a wide range of established and novel biomarkers and aims to identify a set of multi-modal markers for phenotyping prodromal AD, as part of the study, CANTAB cognitive tests are being used at multiple time points to assess changes in cognitive function. Prior to study initiation, a pilot study was conducted as a proof of concept to assess task suitability and participant acceptability of extensive and repeated phenotyping and the acceptability of the CANTAB tasks was also assessed in this feasibility study. Download the poster presented at the Dementias Platform UK scientific meeting 2017.